Tendrán lugar los días 14 y 15 de abril de 2017 en el Union Station, 1820 Market St, St. Louis, MO 63103, USA. Posadores invitados: Flex Lewis, Branch Warren, Tricky Jackson y Kevin Jordan. 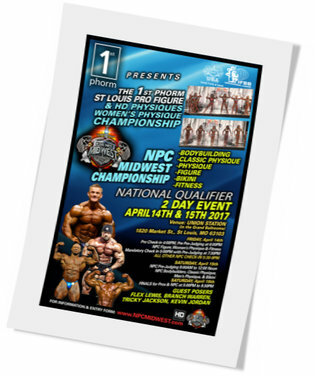 Preselección IFBB: 14 de abril a las 6:00 p.m.
Preselección NPC Women’s Physique, Figure y Fitness: 14 de abril a las 7:00 p.m.
Preselección NPC Bodybuilding Masculino, Men´s Physique, Classic y Bikini: 15 de abril a las 9:00 a.m.
Finales IFBB y NPC: 15 de abril a las 5:00 p.m. This entry was posted on viernes, abril 14th, 2017 at 11:36 am	and is filed under Campeonatos. You can follow any responses to this entry through the RSS 2.0 feed.Both comments and pings are currently closed.